The Leprechaun Chase 10K Omaha, a St. Patrick’s run with a twist, is Pink Gorilla Events’ second oldest event. The race is Nebraska’s largest 10K running race with over 2,200 finishers. 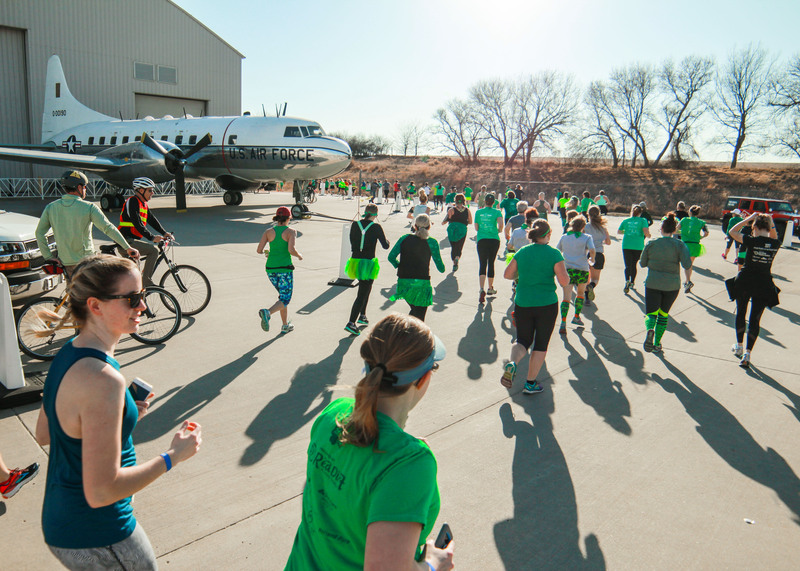 Donning green garb, runners start inside the SAC Museum among historic airplanes, spaceships, and rockets and then run the spiral course through Nebraska’s most popular state park, Mahoney State Park. If you have ever put on any kind of event, whether it be for 20 people or 2,200 people, you have an understanding of the amount of work and preparation that happens leading up to the day. Race weekend is the tip of the iceberg for our team, with the bulk of work happening in the months leading up to the event. All the planning and coordination with facilities, vendors, volunteers, and runners happens prior to race day. The weather is the biggest challenge we face in preparing for race day. We put in abundant prep to determine not only our Plan A, but our Plan B (and yes, sometimes Plan C!) in case of a weather disturbance. At the Leprechaun Chase, our biggest concern in early March is snow on the ground. In past years, we have been fortunate with the weather. This year, our luck (and therefore our parking plan) changed. Based upon the snowfall and anticipated weather, we ordered 20 buses on reserve late February in case we had to go into Plan B for parking at Mahoney. Seven days prior to the race, Lincoln and Omaha had a huge ice and snow storm. I was glad that our race wasn’t that weekend but knew it was likely we were going to have to use our contingency plan. The weather shifted quickly and on Sunday all the snow melted and the forecast switched to mid-50s and windy nearly every day leading up to the race. On Monday, I had a short conversation with Mahoney State Park. They were pretty confident that we could use the pasture, so we canceled most of the buses and kept two – just in case the ground got too muddy after we parked a large percentage of cars. From that point, we had to make immediate changes to parking. I quickly called the bus company. Luckily, they had buses available. As the school day came to a close for the weekend, Ashland High School let us fill out the paperwork to use their parking lot. All I know is if we had gotten the parking notice from Mahoney one hour later, our entire task would have been way more difficult. Our team went into contingency mode until about 10 pm that night. My wife at one point turned to me and said, “I don’t get it, how are you still working on this?” The ‘short’ answer? Even after having a Plan B, we had to change the plan for 2,000 runners and about 50% of the 200 volunteers on race day, find 10 more people to help out, finalize updated plans for the bus company to follow so they knew what to do, create/pack a bunch of signs to help everyone arrive at the right place, and then coordinate all the details with everyone at Pink Gorilla Events. Phew! To be honest, I was really nervous all night – I didn’t sleep well. I was really worried how things would turn out with the new parking plan. As always, this is one of the best races to watch. The course is great for spectators and the chase aspect always holds interest to the very end with the lead guys gaining on the leading ladies. There are always races with husbands trying to beat their spouses, boyfriends trying to finish before their girlfriends plus the normal rivals that you develop during the race. It is exciting to watch the race unfold and see who is going to win, whether lad or lass. Both genders had quality fields this year, so I knew it was going to be entertaining to watch. Katie Wetzstein was the favorite going in and held off the guys, with hard-charging Peter Falcon defending his men’s title but not winning the beer for the guys this year. Ultimately, we had another successful race. As for the parking Plan B, I think it worked out about as well as it could. I know we had a few upset people, but in these situations, it really is a no choice option. Either we modify the plan or we cancel the race… And no one wants us to cancel the race. Even with a muddy pasture, we had a beautiful day, cold green beer, and some of the best costumes, yet. It was another fun race day for the Pink Gorilla Events team getting doing what we love. We sure hope you had as much fun as we did and we’ll see you at the next Nebraska Pink Gorilla Event, the inaugural Early Bird!